The ancient Chinese curse or saying — “May you live in interesting times.” — is upon us. We are in the midst of a new revolution fueled by advancements in the Internet and technology. Currently, there is an abundance of information and the size of social interaction has reached a colossal scale. Within a span of just one generation, the availability of information and our access to them has changed dramatically from scarcity to surplus. What humans will do or try to do with such powerful surplus of information will be the main topic of this article. First, let’s understand what brought us to this current state. 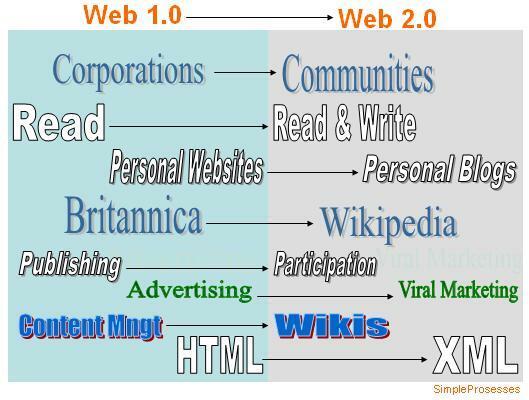 The best way to explain what Web 2.0 is to compare it to Web 1.0, its earlier version. Web 1.0 is a general reference to the World Wide Web before the developments of advanced Internet collaborative applications. This was the period when the Internet was dominated by companies maintaining heavy and static sites for promotions and marketing. At that time, it was difficult to maintain personal websites. Afterwards, there was a sudden shift to Web 2.0. Web 2.0 is what many commonly refer to as the Social Web. It is the portion of the Internet that is developed continuously and interactively by participating Internet users. It is commonly associated with web development and web design that facilitates interactive information sharing, interoperability, user-centered design. Web 2.0 is a catch-all term used to illustrate a variety of developments on the web and a perceived shift in the way the web is utilized. This has been characterized as the evolution of web use from passive consumption of content to more active participation, creation and sharing – to what is sometimes called the read/write web. In 10 years, humans and computers will join forces to create “collective intelligence”. Technology will evolve as such that the Internet (and information within it) will be accessible and available to everyone— this will exponentially increase the already massive data we exchange today. How we (and machines) will make sense of as well as analyze and synthesize this collective information, is what will bring us to Web 3.0 and beyond. Let’s focus on the resulting element — the “collective intelligence”. Think about it as billions of human brains working using future super computers as a platform. Massachusetts Institute of Technology (MIT) professor Srini Devadas described “collective intelligence” as consisting of two pillars: cloud computing and crowd computing. Cloud computing is using the Internet as a platform and making access to information available to everyone. Crowd computing, according to him, involves the analysis of information into “collective intelligence” far beyond what we have today. Please refer to the following diagram where I illustrate how man and machines will achieve such an amazing accomplishment. This involves the process of filtering, synthesis, validation and application that will result into “collective intelligence”. 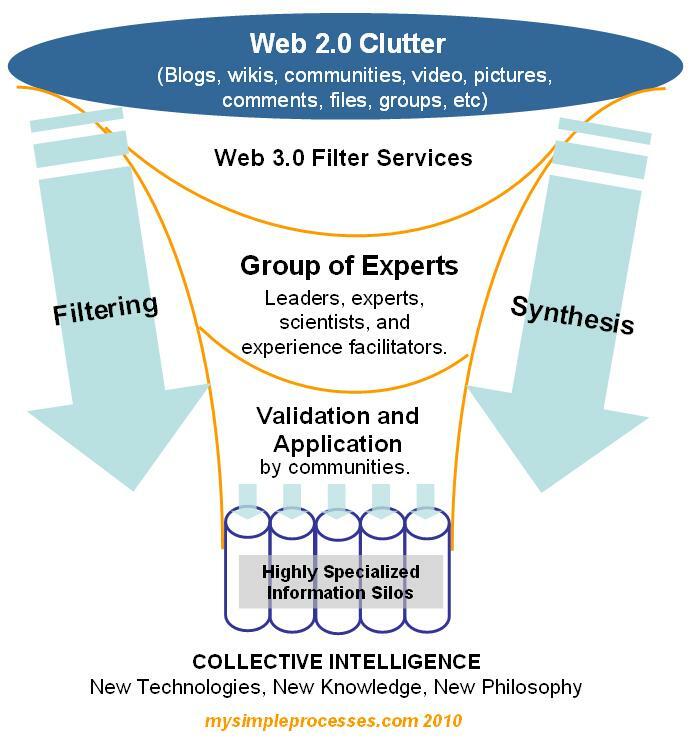 The “Web 2.0 clutter” – the surplus of information – is the raw material for “collective intelligence”. Web 3.0 is essentially the high-quality content resulting from the Web 2.0 mash ups using Web 2.0 technologies as an enabling platform. In the future, more effective “Web 3.0 Filter Services” will allow us to mine billions of gigabytes of information and organize them into sets of knowledge-based containers for synthesis and development. The next filter is the human element- the “facilitators”. This is the cult of experts and gurus. The “future philosophers” in the “future universities”. I believe they will be highly organized and moderated. They will organize the results (the branch of new thinking) into highly specialized information silos. This output is what I call “new things” or “collective intelligence”. New Information, New Technologies, New Discoveries, New Knowledge, New Inventions, New Philosophy — New things! Obviously this is part thought-experiment and part prophesy. I meant to write this to explain how we got to the present state and where it will lead us in a decade. I am encouraging more conversations about the topic. Feel free to comment and post your ideas. Do you spend a significant amount of time measuring performance and looking for ways to improve your service? When you delve into that process of evaluating your effectiveness and efficiency of service, you are, in fact, evaluating your value. Typically, big companies invest one percent to four percent of revenue in IT. This investment is usually spent on integrated digitized platform implementations, continuous innovations, and day-to-day IT operations. Businesses must see the value and return of these investments; otherwise, they won’t put their money in it. What are businesses doing with all that hardware and software IT is providing? Andrew McAfee is a principal research scientist at the Center for Digital Business in the MIT Sloan School of Management. In one of his articles for the Harvard Business Review entitled IT’s Three Key Organizational Transformations, he outlined what he thinks are main organizational transformations that IT provides the businesses. He wrote that companies in all industries are using Information Technology to accomplish three broad and deep transformations: they’re becoming more scientific, more orchestrated, and more self-organizing. I attended the most recent SAPPHIRE conference hosted by the German software giant SAP in Orlando, Florida. SAP presented its newest innovation on In-Memory computing. Co-founder of SAP, Hasso Plattner, declared that by using In-Memory Computing technology, companies can now store data of the whole enterprise in memory. This technology will increase the computing and processing speed of enterprise applications and will give rise to next generation business analytics. You can just imagine the type of scientific analysis companies can run with such high speed databases. In this article, McAfee defined orchestration as designing how work will be done, and then assuring that it is actually executed as designed. Once re-engineered processes gets embedded in ERP and other enterprise systems it becomes much easier to ensure compliance. He gave an example to illustrate his point saying that applications like— CRM, sales force automation, supply chain management, procurement, and so on have brought tight orchestration to every part of the company, and pushed it down to almost microscopic levels. One of IT’s major roles in most big firms is to implement and run digitized platforms. It is usually anchored on a major piece of purchased enterprise resource planning software- such as SAP and Oracle. Software companies are moving quickly on innovating applications to keep up with business demands. The unforgiving global economy brokers no excuse. Business expects IT to provide solutions that help them to stay competitive and in position for growth. “Self-organization, the most recent IT-fueled transformation”, McAfee wrote, “is the exact opposite of orchestration. It is employing technology to let people interact as they wish, with few or no workflows, rules, or hierarchy, and then harvesting the good results that emerge.” The paradigm of self organization has exploded in this part of the decade. In some ways, it started outside the confines of enterprises. There are over a billion users of social media sites on the Internet. Between Facebook and Twitter alone there are more than to 500 million unique user accounts. Companies, with the help of IT organization, have stepped up to leverage these new social tools to enable self organization teams in the business with the objective of encouraging more collaboration, information sharing and innovation. How does your IT contribute to these key organizational transformations in your company? Does the business you serve view you as a value creator and partner? What’s your value proposition?